Want to impress your dinner guests? Serve this classic Italian dish and wait for the accolades. Pound veal cutlets to 1/8-inch thickness, if necessary. Sprinkle cutlets with pepper. 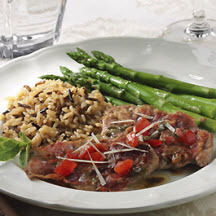 Sprinkle sliced sage on tops of cutlets; cover with prosciutto. Cover cutlets with a piece of parchment or waxed paper; with hand, gently press prosciutto into the cutlets. Heat 1/2 tablespoon butter in large nonstick skillet over medium heat until melted. Place 2 or 3 cutlets in skillet, prosciutto side down. Cook 2 to 3 minutes or until veal is cooked through, turning once so that prosciutto is on top. Remove cutlets; keep warm. Repeat twice to cook remaining cutlets. Add wine to skillet; increase heat to medium-high. Cook and stir until slightly syrupy. Stir in any juices released from cutlets; remove from heat. Stir in 1 tablespoon butter and minced sage. Spoon sauce over cutlets. Top with tomato and cheese. Serve immediately. Nutritional Information Per Serving (1/4 of recipe): Calories: 278; Total Fat: 14g; Saturated Fat: 8g; Cholesterol: 120mg; Total Carbs: 2g; Fiber: 0g; Protein: 31g; Sodium: 427mg. Recipe and photograph courtesy of The Beef Checkoff.